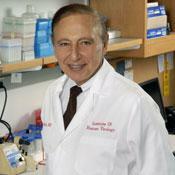 Dr. Gallo has been awarded 31 honorary doctorates, is a member of the U.S. National Academy of Sciences and Institute of Medicine, and a member of the National Inventors Hall of Fame. He is also the recipient of numerous scientific honors and awards. Dr. Gallo was the most cited scientist in the world 1980-1990, according to the Institute for Scientific Information, and he was ranked third in the world for scientific impact for the period 1983-2002. He has published close to 1,300 papers.